I had a recent job, Dear Reader, that started off routinely enough but ended up as being anything but. Kind of the usual story as far as these things go. The job was a routine document service job in regards to a mortgage default. The bank was giving fair notice that unless the default was addressed, foreclosure was looming. As the address where the mortgagors were residing was at a rural address, some way out of town, I was instructed to phone them (numbers provided) to arrange a mutually suitable time. So I begin by phoning the numbers for the husband, Errol Thompson*. The mobile number was answered by an Indian Restaurant while the land line was answered by a male who claimed to have no knowledge of the individual in question. Okay, so I tried the number for the wife, Ethel Thompson*. It was answered by an elderly-sounding woman who, after I introduced myself and having stated my business, terminated the call. I thought that maybe it was me, that the connection was unreliable. So I called her again. "WHAT?" she screamed as soon as she answered. A little taken aback, I again stated I was calling on behalf of ABC Bank* and I wished to arrange a time to come and see her in regards to giving her the documents. "YOU'RE A LITTLE LATE, AREN'T YOU?" she yelled. Er, no, I said - still a little confused. I'd only received them that morning. Alrighty then. So that's the way it's going to be. I informed the Client of the outcome and received their permission to head out to the address on file to attempt to make personal service on the Thompsons. I'll head out that evening. By the time I get out to the area, it's full-dark now and the rural road is unlit. A house stands down a long driveway in the rough location I would expect to find the property but note that there is no mailbox or identifying marker. I drive a bit further and the next property has a higher street number so I guess that the previous location was the correct one. I walked down the dark driveway towards the house. I could see a male in one room at a computer so knocked on the window to get his attention. He was a bit startled and came to the window and asked who I was. I explained who I was and why I was there and asked to speak to Mr and Mrs Thompson. At this point he climbed out the window and said that I was trespassing. Actually, I wasn't. Here you are not trespassing until warned off the property by owner or lawful occupant and you refuse to leave. However, instead of telling me to leave he starts questioning me about my business at this address. I explain I have legal documents to serve on (presumably) his parents. He responds by telling me that as they have no commercial contract or relationship with me, they do not recognise my involvement or authority. He also tells me that any correspondence can be posted to their PO Box address, which is their address for service. I explain that the procedure is that personal service must be effected. He then asks by whose authority? I explain that we abide by the Rules of Service as defined by the District and High Courts. He proceeds to tell me that neither the District nor High Court has any jurisdiction in this matter and that it is a matter for the Admiralty Court. I try not to laugh at this but the guy is clearly not-quite-all-there in the head department. He then tells me that he used to do my job in Australia and the United States so he knows. Then he tells me that no-one at the house will admit to being the persons named in the documents and asks what I would do if he told me he was Matt of the House of Thompson? I explain that I have no documents in that name, however, I would infer that 'Matt of the House of Thompson' is in fact 'Matt Thompson' and would serve any documents in that name, should I have them. "I wouldn't accept them" he says. "No worries, I'd thow them at your feet and draw your attention to them. It's still counted as being served," I reply. "It would be a bad serve and I would sue you," he counters. I just laugh and shrug. He then went on a lengthy rant about Elizabeth of the House of Windsor although I failed to grasp the significance since I was fairly certain that she wasn't in default of a mortgage with ABC Bank. Matt went on to tell me that he had been 'studying' law up on the internet and was advising his parents on this matter. Seemed it all started when they questioned the Bank about some of the charges and the Bank failed to disclose documents within the specified period. Matt also claimed that the family's solicitor was working with the Bank and, when I suggested he could lodge a complaint with the Law Society, laughed and stated they were all working together. Seems that they also couldn't go into the local branch of ABC Bank as they had all been trespassed. Now I understood. The House of Thompson was the victim of a conspiracy. I'm surprised that Matt didn't bring up the Bilderbergers, Reptilians, or any of the usual tropes. I decided, somewhat belatedly, that there was no point in conversing with Matt further. He seemed like a nice enough guy but clearly deluded. I felt a bit sad that his elderly parents were relying on his advice. So I took my leave, certain that I would probably be back at some point. 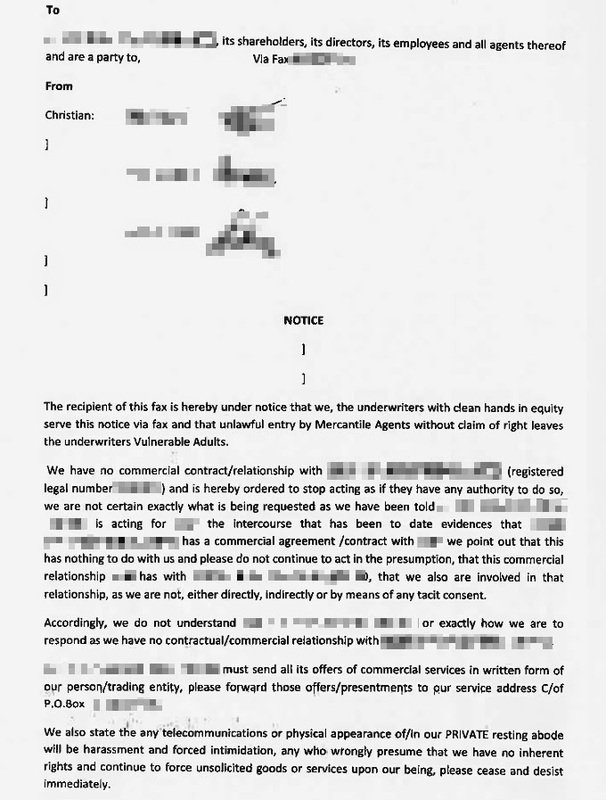 I let the Client know of the outcome and the following day I am told they received a fax from Matt and his parents. For some reason this depresses me even more. * Not their real names. As per usual.